We are thrilled to be giving away works by Toronto artist Jane Murdoch Adams in our inaugural #artisneededhere campaign. For a chance to win her art (one of two gorgeous limited edition prints), go to artisneededhere.com for more details. We love Jane - and her work - because of her incredibly positive approach to making art. Anyone can apply Jane’s philosophy to their outlook on life. Mercartto: You have a somewhat unorthodox background for an artist. What was your life before art? Jane: I had many years doing community development: union organizing, mediation, conflict resolution, all around women’s issues. When everyone was asking “what can I do to be a really good feminist,” I answered by becoming a “Money Feminist”: I focused on pay equity and unions. For the last 50 years I have worked with female-dominated organizations to help them get what they want. I have learned through experience to ask these questions, of myself, as an artist. Other people, including artists, can ask these questions of themselves too! What was best thing that happened that led to some sort of breakthrough that informed the way your work has developed? What are the factors that contributed to it? Was it the people? A mentor? A workshop? Read a book? Middle of the night aha moment? Every artist wants to know how does someone get better at what they do. What contributed to your breakthrough? What were the external factors? An environment was created somehow or another. It’s hard to identify, but this question helps open up a channel for identifying the source of a change. What is it about you? What is it about you that allowed these external factors to influence you? The answer could be that someone is persistent, or someone has a good sense of humour, or an influential figure who featured in someone’s life. Why is this important? What difference does it make that you do what you do? How does it affect the field of art in Toronto? Your partner, your children? It’s important to probe by asking “what else?” Often the first answer can be facile, but if you keep probing you’ll get to the good stuff. What are your three wishes for the future? I like to end my questioning with an action. Let’s use all this energy to drill us into the future. Mercartto: Does reflecting on these questions yourself help with your art? Jane: So often people look for the problems, but reflecting on highlights is so much more uplifting. You train your brain when you do something a lot. So when I look at my painting, I am much more likely to ask myself “What works? What is the peak experience of this particular painting?” rather than what I don’t like about it. Mercartto: It’s a very optimistic way of approaching it. Jane: That’s a perfect word! We’re just making our lives up as we go along. What can guide us except for our enthusiasm and optimism, and do we feed that? Mercartto: A couple years ago you departed from your previous style. Was that part of your peak experience self discovery? I thought, “I paid a lot of money for that course. I am not going to be a victim. I am going to try to salvage something out of it.” I decided to cut up every piece of paper I own into as small bits as I possibly could. I started to play around with the pieces and began creating collages. Mercartto: I love that you don’t regard your work as so precious that it can’t be transformed. Jane: I want my art to come out of a joyful part of who I am. It’s a celebration. For example, I featured bees in a series because they’re endangered, but I didn’t want it to be a Eulogy to Dead Bees. I wanted to make the bees like magic. I did that for a couple of years, and I sold a lot of bees. But then I wanted to try something new. Mercartto: What do you experience at that moment that you decide to essentially destroy a piece of work that you’ve created, even if it is to reinvent it? Jane: You have to be willing to kill your painting! To make dramatic changes! If you’re just poking around in the corner trying to improve your work, you’ll never evolve. You have to take the risk. Mercartto: We’re so thrilled to be giving away works from your Frida Kahlo series. How did that come about? Jane: The Frida series began as a little joke. During an interview following one of my shows, I was asked how as a child I recognized myself as an artist. I knew during the interview I would be asked my plans for my next show, but I didn’t have a clue. So I whipped out a book of Frida Kahlo paper dolls and declared that I was returning to my childhood roots. Even though I was joking at the time, a few weeks later it dawned on me that I love Frida Kahlo! Why don’t I explore that? So I made these large paintings of Frida with fabulous outfits and wonderful headdresses. Then I read Alain de Botton’s “Religion for Atheists”. His chapter on Tenderness observed that in modern society we don’t cultivate tenderness in our art, but it’s something we all aspire to. We all yearn for that feeling of tenderness. I had a revelation: more than anything, Frida wanted to have a child but never did. This inspired my series called Tenderness with Frida holding a child. Mercartto: How has the series been received? Jane: People love it. I put the first one on Facebook and it sold within two hours. Each time I posted one people would call asking to buy them. I realized it touched people’s hearts. By the time I had my art show I had to borrow them back from the owners! Mercartto: Why do you think Frida still resonates today? Jane: In my research I observed that Frida was constantly featured in political activities like marches. There have been these huge outpourings of women’s power and the March on Washington that was replicated all over the world. It was electrifying for me, an ardent feminist from the 70’s and 80’s who feared that feminism had skipped a generation. Suddenly there’s this groundswell of younger women on the march. There are stunning photographs on line of women demanding justice; it’s very moving. I want to capture this Women Demand Justice / She The People strength in my art and give it back to the women from those communities. Mercartto: How do you maintain your optimism and positivity? Jane: I think it comes from your friends. Don’t surround yourself with people who just criticize; find people who will help you dig deeper. I’ve also just had such a long career of doing things that were extremely hard, that stretched the utmost limits of my intelligence and stamina. Things that I had done were really, truly scary. There is nothing scary about creating art. What’s the worst thing that could happen? Mercartto: What would you say to someone who is unsure about buying art? Jane: The only criteria is enthusiasm, for your own life too. If you feel really enthusiastic, that’s your intuition - and it could be wrong - but if you feel a real charge from a piece of work, that’s telling you something about who you are and what makes you happy. And if you don’t feel really excited, like “YEAH!”, then don’t buy it. Keep looking at art until that happens! 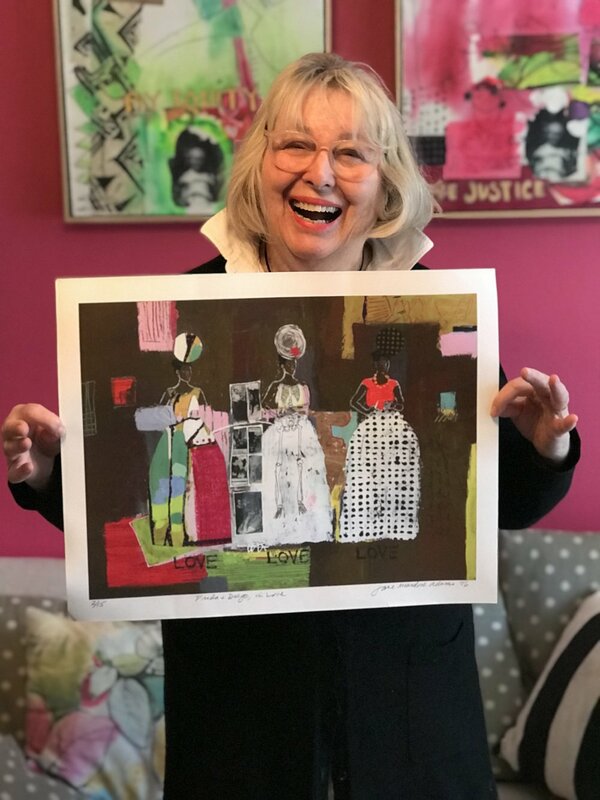 To win Jane's art, please go to ArtIsNeededHere.com for information how to win.